PC gaming is booming. PUBG is hot, Fortnite is on meme status and sports moguls like Bob Kraft and Jeff Wilpon are buying up esports teams left and right. So in an attempt to get something out of the trend, HP the world’s biggest computer maker, is looking embrace the trend and keep step with its fellow Texas computing rival by launching is own line of low-cost gaming systems. Starting at $549, the Pavilion Gaming 690 tower is the cheapest of the bunch. It comes with an AMD Ryzen 3 2200G CPU, 8GB of RAM and a 1TB HDD, but can be configured with up to an 8th-gen Intel Core i7 CPU, 12GB of RAM and an Nvidia GTX 1060. The one drawback to the 690, is that due to its size, HP says the case can only accept half-sized GPUs—no 1070 or 1080 here. That also means people who want extra graphics power will need to upgrade to the Pavilion Gaming 790, which starts at $749 for an i5 and a Nvidia 1050, but can be loaded with up to 32GB of RAM and a 1070 for $1,699. Unlike more expensive gaming laptops, you can’t adjust the keyboard’s back light. Instead, you’ll be able to choose from three colors: green, white, or purple. Meanwhile the cheapest Pavilion Gaming laptop (which is only available a a 15.6 model) starts at $800 for a i5 chip with 8GB of RAM, an Intel Optane drive with a 1TB HDD and 16GB of storage acceleration, and a Radeon RX 560X GPU. Additionally, aside from black and green color scheme HP is using for Pavilion gaming, the laptop will be available in purple and white accented models. 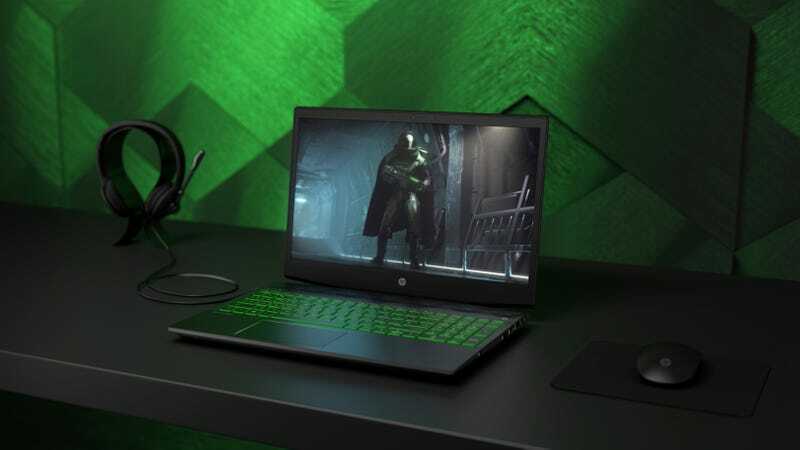 But perhaps the most interesting part of HP’s new portfolio is the 32-inch Pavilion Gaming HDR Display. While it doesn’t support the full HDR like you’d get on an expensive TV, the giant monitor is VESA Display HDR 600 compliant, which means its brightness is rated at up to 600 nits. 600 nits is dim compared to the panels found on TVs that can be over 1000 nits, but if you consider most phones and laptops can go over 500 nits you’ll recognize it’s still plenty bright. The the panel should also be able to cover up to 95% of the DCI-P3 color gamut—which means a lot more red and green that you’d be used to on a more standard sRGB display. In keeping with the line’s budget-minded specs, the display’s resolution only goes up to 2560 x 1440 instead of full 4K. However, you do get built-in AMD FreeSync support and a 75Hz refresh rate so you can better prevent the effects of screen tearing and make your games look smoother. Unfortunately, there’s no pricing available yet for the display.